As a professional surfer, a huge part of Dan Malloy's job is to travel the world. He chases the swells, finds the perfect waves, and tricks off them. The whole experience is filmed and photographed to be published in a magazine or documentary of course. He makes memories. However, many of Malloy's trips were rushed, and the shoots were forced. Malloy decided, that if he really wanted to capture amazing moments, if he wanted it to be organic, he had to slow down -- and not just for the sake of making great pictures. "I know that when you slow down, that's when you really learn. I feel like it's fast paced these days and it drives me a little crazy," Malloy says. That's when Malloy came up with the idea of going on a slow paced trip: One he could take the time to absorb his environment and make memories he will never forget. In September 2012, Malloy embarked on a 700-mile journey down the coast of California with photographer Kanoa Zimmerman and filmmaker Kellen Keene. Malloy and company controlled their trip completely: They traveled by bike, which added limitations to their travel and forced quick decision making. All they took with them was one surfboard, a few cameras, a bag of film, swim gear, and a two-man tent, and they recorded the whole adventure. Slow is Fast, the 112-page book and 30-minute film of the trip was originally published by Malloy in March 2013. The self-produced book/dvd sold 3,000 copies, and now Patagonia is re-releasing Slow is Fast March 15, and it will be available at Patagonia stores and on Amazon.com for $30. Malloy and the crew will tour Patagonia stores for special screenings of the film in April (dates are TBD). 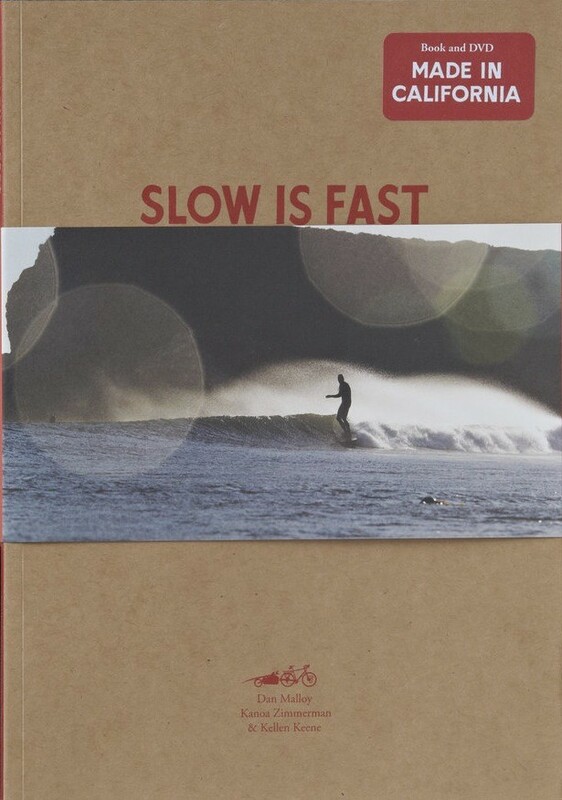 Slow is Fast Book & DVD with Dan Malloy, Kanoa Zimmerman and Kellen Keene from Patagonia on Vimeo. The documentary follows the three as they biked 58 days, making stops to discover communities and learn about sustainable living. Malloy surfed along the way, but the focus was flipped -- this trip was about documenting great moments, whether that involved surfing or not was up to what the environment provided. "I had an idea to document some really interesting farming, people interested in surfing, crafts people and just to see what we could see along the Californian coast," Malloy says. Through the adventure Malloy and the crew visited and surfed with a San Franciscan surfboard artist; they hung out with bladesmith and surfer in San Luis Obispo, and they worked on a couple of family farms, just to mention a few of their feats. Malloy believes that this trip was a once in a lifetime experience that taught him more about his homeland, California, than he ever could have in his regular travels. And he credits fellow traveler Keene for the idea becoming a reality. While en route to a farming auction some three years ago, Keene and Malloy were tossing around ideas for a shoot. Malloy said he was tired of the modern mindset of a fast paced lifestyle rushing around traveling by car and plane. Keene concurred. When Malloy proposed that they document a trip by way of bike, Keene checked his calendar -- and next thing they knew, Zimmerman had joined them, and they saddled bikes with gear packed, ready to go. The three were dropped off 100 miles north of San Francisco. They headed south, and the rest is history. Both the book and the video are filled with beautiful imagery of California. From Mendocino County, San Francisco, San Luis Obispo, to Cuyaya, the three documenters have collected a book of moments that are captured artfully and tastefully. A story arch is lacking in both book and DVD, but for the most part, each individual photo and feature stands alone acting as support to the theme of sustainability and craftsmanship, ideals that Malloy strives to showcase through Slow is Fast. Overall, Slow is Fast is a tribute to those who participated in the making of the book/film, and it shows a true human connection in the friendships created, and it captures what life is without the noise of corporate America. "It really did prove to me that if I break my normal mold and take time, that everything you need is right at home. And there's a lot to be learned and experienced at home. So for me that was the huge takeaway," Malloy says.